Discuss tires and wheels in this sticky thread. Last edited by ColdCase; 02-25-2015 at 12:31 PM. I like the all-terrains. Same size tires as factory? Also, I know few people on here are looking to swap thier 20s for 18s and a lot more are looking to swap thier 18s for 20s. I myself am looking to get my hands on some 20s, I'm in Baltimore MD. So if you wanna trade/sell let me know. They are 275/65R18 stock was 265/60R18, went from a 30.5" tire to 32". Future Mods: Still Waiting for more accessories to be offered. Do you experience any tire rub?? None at all but I haven't done any heavy off roading. have you noticed any decrease in fuel efficiency with those puppies on? Road noise/etc? I wasn't able to notice any decrease in mileage because I put on these tires pretty soon after purchase. I did notice some decrease in responsiveness in quick acceleration. They are very quiet tires and I haven't felt any vibration. 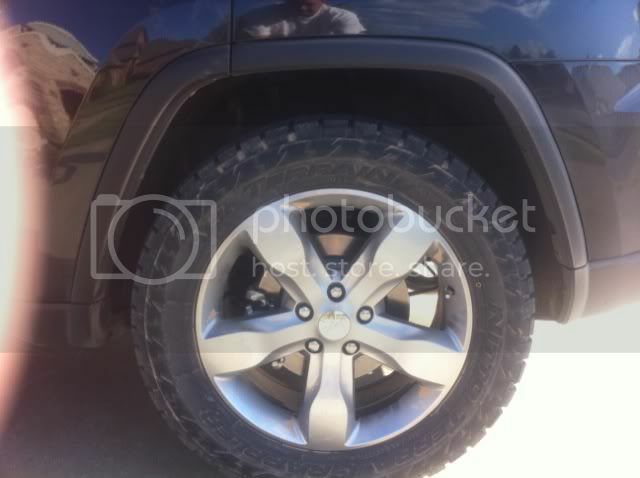 I really like the BF Goodrich tires, do they make them in 20's? I see yours are 18's. None that will fit stock, the smallest is 275/65R20 which is a 34" tire. There is a 285/55R20 that is only 32" but I think the width will be to wide. Armor: Skid plates, rock rails. What height do you guys have your JGC lifted to in the pictures? Also looking to replace my stock wheels/tires. But can't decide which direction to go, either keep the 20's and slap a set of the Nitto Terra grapplers on or trade out the 20's and use 18" wheels like 2011Hemi has. Both look great! 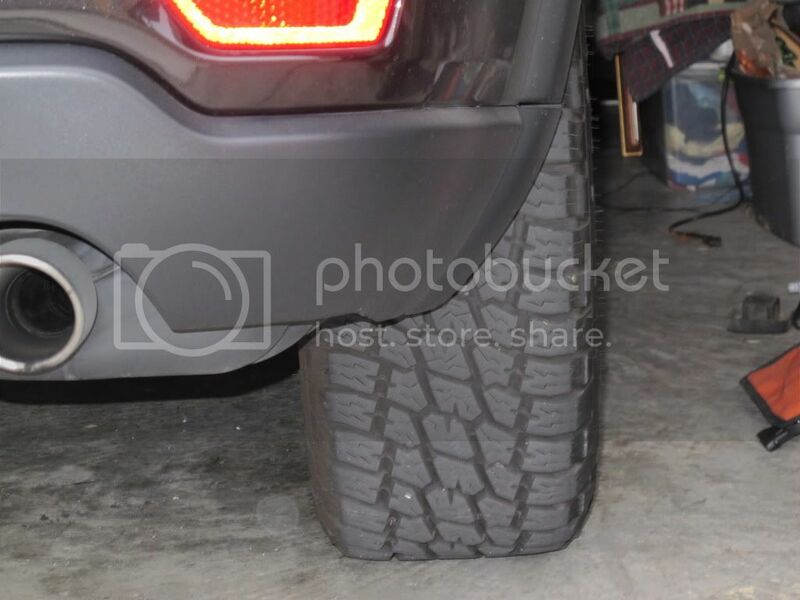 Could you guys post picture angles to show the width of the tires? (in addition to the side shots) I'm trying to get a good feel of how the vehicle's stance will look. (something like this picture which I really like the look of also) Thanks guys! 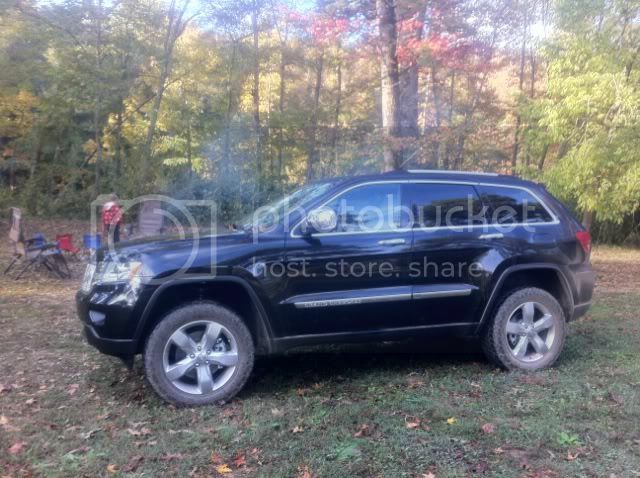 Correct, mine is an Overland and it is in the off road 2 height in the camping photo. Here is a rear width pic for now and I will get you another angle like in the photo you posted later today.